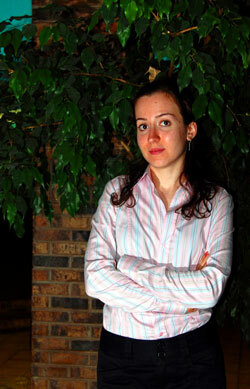 During the 2007 US Women’s Chess Championship, IM Irina Krush was fierce at the board. She didn’t joke around with the other players. She sat alone at breakfast, though she was often on the phone. She was a competitor who was willing to reach within herself to retrieve her desired result. She often came to the board in her black leather jacket with her long brown hair pulled back. She loves chess and is passionate about learning more and playing well. That is the side of Irina we often see, but she is also loving, grateful and devoted to her family and friends. In the last round, Krush won against Tatev Abrahamyan and claimed her second U.S. Women's Championship title. That evening, Irina had a lot to say. When did you first become serious about chess? I played in my first tournament sometime in 1990. My dad taught me to play when I was four. I played pretty well before he put me in my first tournament. I think my first rating was like 1200, maybe even a little bit higher which was good for six years old. I’ve always been serious about chess. It's never been out of my life and it has always been the main activity in my life. My attitude to it was very different when I was seven though. The role that chess plays in my life was formed at the age of 13 or 14. That is when I started studying on my own. Up until than I never really studied by myself. How did you study on your own? When I was 13, in junior high school my father arranged it so I didn’t have to go to school every day. That gave me time to study openings. It was also the first time I used a computer. It was 1997- I had a desktop; I didn’t have a laptop. Even that access to information and games helped me a lot. I remember right away how my opening got a bit better. I was able to play 2300 players and feel confident. The change was really palpable. In 1996 I was 2200. In 1998 I was 2470. It was a big jump and it was because I was spending more time on chess. What is the first opening you learned and fell in love with? I’ve never fallen in love with an opening. I don’t remember loving anything, but I have always played the Sicilian. Since I was 11 or 12 I have basically played d4, Queen’s Gambit Accepted, and the Classical Sicilian. My favorite opening is the Sicilian. What have you found to be challenging about being a girl chess player? I haven’t found anything challenging about being a girl. I think chess is challenging, no matter who you are. I think people in the chess world have always been nice to me, I have never been taunted by boys. What teacher was most influential in your life and why? My childhood coach Mikhail Trosman. He was my coach from the time I was 9 until I was 14. It was a critical time. When I started working with him I was about an 1800/1900. When I finished working with him I was 2470. We basically stopped working together when I became the US Women’s Champion in 1998. I started working with some GMs then because there was nothing more he could give me at that level. There was such a huge difference from when I started with him and when I ended. He was definitely instrumental in getting me there. No one since than has led me to that kind of improvement. What advice would you give to young chess players? You have to play a lot, study your games, and analyze often. Anything you study will improve your game. I think most players rated 1000-2200, or even higher should mostly be reading tactics books. I am still doing tactics books; it never really ends. What is your opinion on female only tournaments? I have nothing against them. In general my goal is always to play strong competition. I don’t restrict myself to female only tournaments. I was happy to play in the US Championship. If you ask me what do I prefer, the US Championship I played here a few months ago or this tournament (US Women’s Championship 2007), of course I prefer what I played in a few months ago because my opposition was much tougher. I played 5 GMs, 3 IMs, something like that. I didn’t play a single untitled player. If you give me an all female tournament that’s going to have a 2500 average rating, or close to that I will be happy to play in that too. They are not weak players. Most women around that rating are actually stronger than their male counterparts. They have had more training; they have been subjected to high-pressure situations more. In this tournament I was attracted to the prize fund, but the main thing was the title. I really don’t have a regimen where I am going to study for six or seven hours. It is not like that, sometimes I wish I could. How did you feel coming into this tournament? Do you read all of the stuff that is written about you? I definitely read Chess Life Online. Of course, I have to read that web site; my good friend Jennifer runs it. I read Greg's predictions on the likelihood that each player would win the 2007 U.S. Women's Championship. I agreed with his guess that I would win about 40% of the time. I appreciate that he thought that my changes were that high. I understand that means that 60% of the time I won’t win. I had Black against Camilla and Anna. It did not inspire me with too much confidence. It is a little bit annoying to have black against the other two strong players. But you know what? Every tournament you don’t win, you feel like it is horribly disappointing. Maybe I can’t always win with people like Anna, Rohonyan, and Camilla in the field but I still feel like I should enough of the time that I’d be disappointed if I never did. Greg made a good point in his article. I’ve had a drought in these US titles, the US Women’s Champion. That was a helpful sign from the universe. If I had won it three times in a row, everyone would have been like, "It is about time she lost." I haven’t won in so long, it was a good sign, and it was my turn. I am satisfied because I won. It's not that I am dissatisfied with my games, I’m not. I am happy with my last round game. I was in a must win situation against Tatev Abrahamyan and I was playing black. Chess is like a test of character. When I am given the opportunity I like to step up to the plate. From that point of view, I was proud of my play and approach against Tatev. I was just determined to win that game. I’ve been in some of these critical last round situations in my life and I wasn’t always able to come up with anything. Sometimes I needed to draw like for a GM norm and I would lose, or I would need it for big money and I would lose. But this year I have had some of those situations again and I’ve managed to get the needed result and I was happy I was able to do that here. Maybe it shows that I’ve kind of improved in that area. Before the game I was tense. I didn't sleep well- only seven hours. I woke up early because I needed to prepare because today I was trying something new. It worked like a charm. I’m very happy with what I came up with (1.e4 c5 2.Nf3 a6) This is the only time in the tournament that I deviated from what I normally play. It was the perfect situation and the perfect opponent and the perfect variation. I am not sure I could have won had I played my normal stuff. Not because I am a worse player in that position, but because that position is a lot harder to win. What I got was totally my cup of tea. It was supposed to be a Sicilian; it turned into something that looked like a Queen’s Gambit, like an isolated Queen’s pawn position where I have a lot of experience against that playing Black. I got a very comfortable position when my opponent basically missed some simple tactics. If I hadn’t won the tournament I would tell that I was not happy with my games. I would have regretted the draws with Black that I made. The way it ended I can say it was fine. I didn’t do anything spectacular. I played my usually solid chess. I didn’t dominate the tournament. I won because my other competitor, Katerina Rohonyan, drew in her last round. A playoff for first place would have been a lot more logical. I'm happy it didn't get to that. Besides the win over Tatev, was there another game that stood out for you in this tournament? My best game in terms of both my play and my opponent’s play was the game against Rohonyan. I was a bit disappointed because I didn’t manage to win that game being White. From my perspective that was the game that was going to decide the tournament. I did go for it. I played an interesting game. I made a pawn sacrifice. It didn’t work out, she defended well and it was a draw, but it was a fighting game. I tried, I had White and I tried. It's not like you can have a forced win anytime you feel like it. Where were you when you saw that Katerina had not won and there would be no need for a playoff? I only came here to see what was going on and just to kind of say, “Hey, what time is the playoff?” because I wanted to get lunch. The computer was crashing in my room so I had no idea. When I came here I saw Melekhina and Rohonyan talking and I asked how did you do. I could tell from the look on Alisa's face that she probably didn’t lose, and I thought how could that be? I thought she was going to the rook endgame from the last position I had seen. She told me she drew and I was like, “Oh god I love this girl”. Irina on the cover of April's Chess Life Magazine. You have been having a good year. I have been having a good year. It is almost surprising to me. But I think it makes sense. I finished college a year ago. Obviously that took up a lot of my time, I was not studying chess as much, I wasn’t able to play as much. It makes sense from a practical point of view that I have more time to study chess, when I go to a tournament I don’t have to freak out worrying about my papers and exams when I come back. I don’t have to take work with me I feel like this is a pretty stress free time in my life. I am able to study, just do chess, and play in tournaments whenever I want. I’ve also made some psychological adjustments that have definitely contributed to my game. I work part time. I work at one of Elizabeth Vicary’s schools. I really enjoy that, I like working with her and her students. For the last year I have taught for three afternoons a week, two hours each. I now have a couple of private students on the Internet. I am not really doing that much. I do it to earn some money; obviously you have to earn money somehow. But it is not drudgery, I like working with my students. Who was the first person you called when you found out you won? IM Irina Krush with GM Pascal Charbonneau. Do your parents watch at home when a tournament you are in is on line? My dad watches. My mom said my dad was going crazy because the relay was broken. But, yeah they watch, my dad has learned to use MonRoi. I just want to say I know a lot of people rooted for me here. I have a lot of support in general. I feel I am very fortunate like that. Maybe some people hate me or want me to lose, but I have a lot of good people in my life supporting me. Pascal is one of them. Usually I will have Pascal prepare for me if I need it. I will ask him to look at a particular line and analyze it. This time Pascal had his own tournament to play in so I wasn’t going to ask for his help. I was already preparing for the play off against Rohonyan, I was like I am not going to have time to do this so I asked my friend, look at this line. He did and sent me a file today. It didn’t come in handy, but it is a lot of work and he was willing to do this for me. I am lucky. I have a lot of people in my life; I have a lot of love in my life. It is one of the best things about my life, probably the best thing, just the people in it. And I feel good, I feel good I won. Irina Krush after her 2007 U.S. Women's Championship victory. Photo Betsy Dynako.